When I was invited to celebrate eHarmony’s 10th Anniversary with them both in Los Angeles and New York, I couldn’t say no. 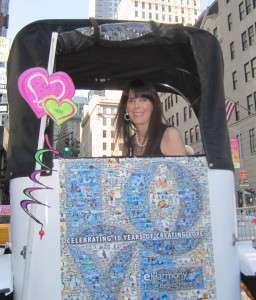 Unfortunately, I missed the wedding ceremony for success couple Sheri and Rob at eHarmony’s headquarters in Pasadena due to a last minute trip to New York, but luckily I met up with the newlyweds during the online dating site’s pedicab parade in Manhattan. 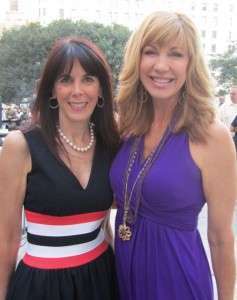 Bright and early 25 online dating success couples along with Grand Marshall, Leeza Gibbons and eHarmony executives, we arrived at The Early Show plaza for our first stop of the day. The success couples were dressed in tee shirts commemorating the decade of love from eHarmony with their new campaign, “Love Begins Here.” After brief appearances on the CBS morning program, we boarded our pedicabs for the motorcade throughout the city. Our next stop was at Rockefeller Center, home to the Today Show. Leeza emceed the first of many kisses among the couples who found love online. We continued to FOX News and ended up in Times Square to view the new 4-story mural of thousands of singles who met on eHarmony. Congratulations to eHarmony for 10 years of helping singles find love online.